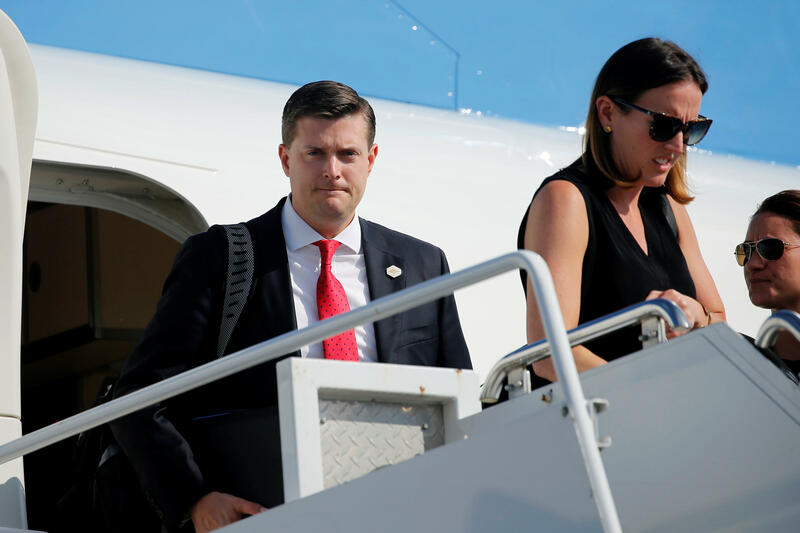 Colbie Holderness, the first wife of former White House staff secretary Rob Porter, may be relieved that White House counselor Kellyanne Conway believes the accounts of Porter's abuse of her and of Porter's second ex-wife, Jennifer Willoughby. But she was dismayed to hear that Conway doesn't think White House communications director Hope Hicks, who is now reportedly dating Porter, has much to fear. "I don't worry about her in that respect," Conway said of Hicks. "I've rarely met somebody so strong with such excellent instincts and loyalty and smarts," she told CNN's "State of the Union" Sunday. It was a jarring sentiment to hear for Holderness, who had predicted that if Porter hasn't started abusing Hicks, he will. Conway's statement, Holderness wrote, "implies that those who have been in abusive relationships are not strong." "I beg to differ," said Holderness in the op-ed. Abuse, she wrote, takes many forms. "The abuse can be terrifying, life-threatening and almost constant. Or it can ebb and flow, with no violence for long periods," she observed. "I also never imagined I would be in an abusive relationship," said Holderness, noting that "being strong — with excellent instincts and loyalty and smarts — does not inoculate a person against abuse." She said she didn't see it coming for years, writing, "The really ugly side of Rob's abuse only came out after we married, following three years of dating." Abuse doesn't discriminate between rich and poor, Holderness observed, among those who are the least or most educated, or between those who have or do not have support from family or friends. She concluded by noting that Conway had been trying to address Mr. Trump's positive comments regarding Porter, but that the White House press secretary declined again Monday to say whether the president believes Porter's ex-wives and their accounts of abuse. "While I cannot say I am surprised, I expected a woman to do better," Holderness wrote, and she quoted Conway from the CNN interview. "'There's a stigma and a silence surrounding all these issues. . . . Those who are in a position to do something about it ought to.'"